Never heard of Lake Arrowhead? That’s great because it’s a hidden gem located just 1 hour north of Atlanta. This means quick trips to the Georgia Aquarium, World of Coke and Turner Field. Being in NorthWest Georgia it's a short drive to the Apple Festival, Pumpkin Patches (checkout Yahoo Farms) and hiking (closest trail is Pine Log Creek). - at 540 acres is one of the largest private lakes in Georgia. - Great fishing for bass, crappie and bluegill. - 1998 20' SunTracker pontoon boat. - two seats have cracks but rest are in good condition. - One of the closest lakefront property to the amenities. - House is only 1 set of stairs above the lake. - Private wooded view across the cove. - Free use of the 2 kayaks. - Parking for 3 cars. Additional cars can be parked at Great Festival Park. - Water only 1-2 feet off dock but you can just float 30 feet up cove to deeper water. - Downstairs bedroom located off unfinished basement. - Unfinished area provided for storage and easier access to lake. - Window ACs provided for loft and spare bedroom for guests who require extra cooling. - House located in the Narrows subdivision. We wanted to provide an affordable property that allows everyone to enjoy all the benefits of a private lake and community. Living in Atlanta we wanted something close. The private lake offered clean water at a consistent level, less traffic and more security. We are on the west side of the lake which is close to all the amenities. We have a private wooded view is secluded cove. This means no boats or neighbors across from you. House located on small quiet cove. Looking to the left you can see even more of the lake. Maps does not show our location properly. We are lakefront at end of cove. 3 car driveway. All other vehicles must be left at Great Festival Parking Lot. Pontoon rental available. $295 for 2 days, $700 per week. Driver must have boating experience. A wonderful location, peaceful and quiet. The home is well equipped and comfortable. A value at any price. Right on the lake with a deck overlooking a quiet cove. Our family enjoyed our time at Lake Arrowhead. This is not a luxury home, but it is perfect for a lake getaway with the dogs. This house has everything you need (except a blender). 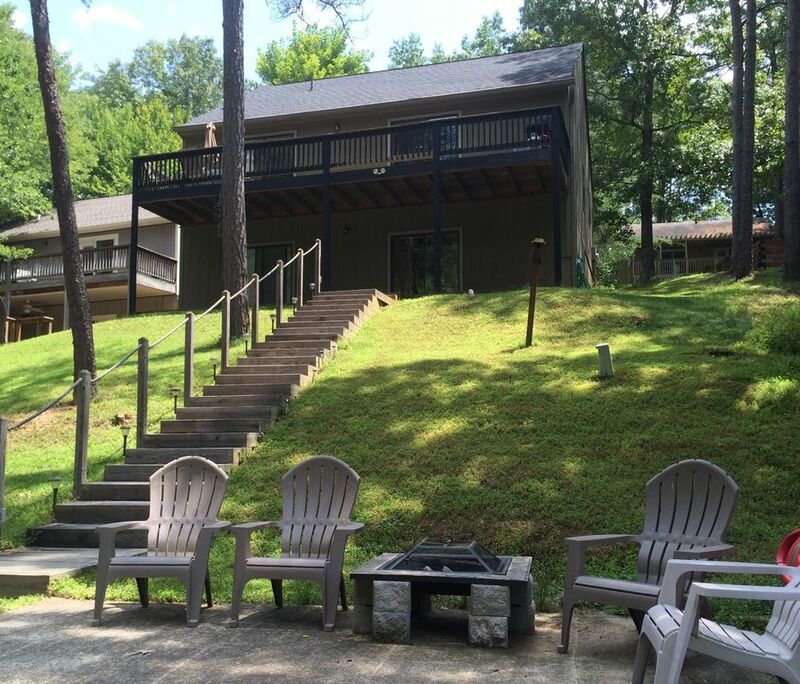 We enjoyed our stay very much and would recommend this house to anyone who just wants to enjoy the lake and a fire. We had no problems finding or accessing the house. Everything worked and all was very clean except for some dog hair on the stairs but we brought a dog too so it wasn't a big deal. We were very comfortable. We kayaked and hiked and built a fire each evening at sunset with a cocktail. Very relaxing! I liked that I could bring my pet and I loved the price of this lake house! I grew up a member of Lake Arrowhead Country Club and lived in a house across the street from this one. It was nice to be back and enjoy this private lake again. I rented this cabin for a groom and groomsmen for a weekend wedding. Access to the gated community of Lake Arrowhead as well as access to the cabin was required to use the cabin. Was not informed until cabin was paid for that only 3 vehicles were allowed in driveway for 10 expected guests. Was required to sign contract on the day of access when full payment for rental was made weeks in advance - this detail should have been done days if not weeks before. Nice property, but owner very sloppy on important details and access. Get ALL THE DETAILS before you rent this property and save yourself some headaches. Great stay on beautiful lake! We had a great time at the lake house! The house had everything we needed. We kayaked, fished, and enjoyed the view! Would love to come back, stay longer, and also get out on the lake with the pontoon boat. Nice lake house and great clean lake. Property was well maintained and clean.Pontoon was fun also.I would definitely stay there again. As I shared with the owner after our stay, When we arrived, there were dirty dishes in cabinets (milk crust in cups, dried cheese in cheese grater, crumbs in bowls in cabinets) and surfaces were grimy and not cleaned. As far the bedrooms, there were chips under the sheets in the master bedroom, a toe nail on floor in the other main floor bedroom, and dirt in each of the showers. I know this cabin is cheaper than a lot of the homes in the area and the no frills and basic amenities is not an issue. What we do expect, is that we arrive to a sufficiently cleaned house. We spent the first day cleaning dishes, surfaces, and sheets ourselves so that we were comfortable enough cooking, eating, and sleeping. everyone expect cleanliness. Half of the guests (4 people) departed early because they were just too uncomfortable with finding evidence of lack of cleaning and just could t relax on their vacation. Aside from the cleaning, we did have to spend time looking for toilet paper for all but one bathroom (we found 4 roles in a closet in the basement), find garbage bags (None of the trash cans had bags in them) and had to re wash towels since they were left in the laundry in a pile still damp and musty smelling. The cabin itself was what we expected in terms of amenities, furniture, location, etc. which was more than adequate for what we were looking for but we were disappointed in how much we had to do before our vacation weekend for some R&R. This is an accurate review at that time. House was in good condition in mid April as we were up there several times fishing. Our early May renters left the house in very poor condition and for some reason the cleaning company did not report any of this. We visited the house several times in late May to bring the property back inline. We have also hired a new cleaning company and a property inspector to make sure this does not happen again. PROPERTY MARKER IS NOT CORRECT. THE HOUSE IS LOCATED ON NARROWS LOOP AND IS WATERFRONT. Also, closest lake front rental to golf, tennis and swimming pool. Holidays have longer stay requirements and rates will be slightly higher. June reservation must begin or end on weekend. Reservation deposits are non-refundable. Remaining balance requires cancellation notice 45 days prior to check-in for refund.